Dr. Hesley is an Assistant Professor of Radiology, and Dr. Hartman is an Assistant Professor of Radiology, Mayo Clinic College of Medicine, Rochester, MN. Fewer than 10 years ago, the authors decided which patients should receive ionic versus nonionic contrast agents based on the patient’s age, medical histories, known allergies, and the examination being performed. Since the price of nonionic, low-osmolar agents has decreased, these agents are now used nearly universally for intravenous (IV) contrast administration. While the advent of nonionic, low-osmolar contrast agents has led to a decrease in the frequency of adverse contrast reactions, reactions from both iodinated agents and gadolinium agents still do occur. In addition, patients with iodinated reactions are known to be 2.3 to 3.7 times more likely to have a reaction to gadolinium.1,2 These events can range in severity from hives to cardiovascular shock. Screening patients prior to the administration of contrast as well as preparation to immediately evaluate and treat these reactions is important in providing good-quality patient care. The most effective management of contrast reactions is to prevent them from occurring. While contrast reactions are idiosyncratic, it is important to have a good screening program in place to decrease the number of patients who might have a reaction. In our practice, nursing personnel interview the patients about any history of reactive airways disease, cardiac problems, previous IV contrast media administration, any associated contrast reactions, and any allergic reactions to medications or other allergens. We also obtain a complete list of their current medications. Due to the nephrotoxic nature of iodinated contrast agents and the recent implication of gadolinium in the development of nephrogenic systemic ﬁbrosis, patients are also asked if they have a history of renal problems or if they are diabetic. Patients who have a history of prior anaphylactoid contrast reaction are usually premedicated before any contrast administration. Premedication algorithms, including those recommended by Lasser and Greenberger, can be utilized.3–7 Both premedication regimens use steroids to help stabilize the cell membranes of basophils and mast cells to preempt the release of potent vasodilators. Diphenhydramine and, in some cases, ephedrine are included in the Greenberger protocol.6,7 Alternative tests that do not require contrast administration should also be considered for patients with prior moderate-to-severe reactions. It is important to note that the acute treatment of contrast reactions does not include the administration of corticosteroids. However, the administration of 200 to 300 mg of hydrocortisone can be helpful in the prevention of rebound reactions following the initial treatment of a reaction. Being prepared for a reaction requires access to the proper medications and equipment for the treatment of common reactions following contrast administration. 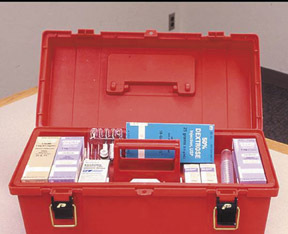 Stocking a small medication box with commonly used medications is recommended (Figure 1). Such a box should include oral and IV diphenhydramine, epinephrine in the subcutaneous (SQ) 1:1000 and IV 1:10,000 dilutions, atropine, nitroglycerin, 50% dextrose solution, furosemide, B-agonist inhaler, and corticosteroids. This preparation prevents unwanted delays that might occur if someone had to sort through a larger emergency cart used predominantly for the treatment of cardiac arrest situations. Having these medications (as well as a copy of the American College of Radiology’s contrast media guide or your institution’s guidelines for treatment of reactions) readily available where contrast is being administered is helpful in ensuring that the correct medications in the proper dosages are administered. This is particularly important since contrast reactions are infrequent occurrences and dosages may not be readily remembered. 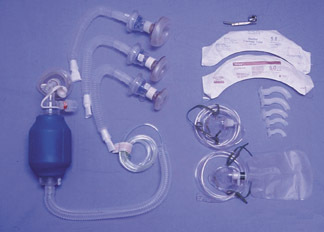 In addition to the proper medications, it is also important to have a variety of airway devices (including bag valve mask devices for patients of all sizes and ages, nasal cannulas, oral airway kits, suction devices, and an oxygen source) to provide proper early care in the treatment of many reactions (Figure 2). Access to an automated external deﬁbrillator or other deﬁbrillator is also recommended in the event of cardiovascular shock. At the Mayo Clinic in Rochester, MN, >90,000 doses of IV contrast are typically administered each year and more than one third of the contrast reactions are caused by the administration of gadolinium. The most common contrast reaction is hives, which typically present as raised red wheels that may or may not be associated with pruritus. When hives are mild, they can simply be observed. However, patients who are more symptomatic may require oral (PO) or IV diphenhydramine at a dose of 25 to 50 mg. Diphenhydramine is an antihistamine that has both anticholinergic and sedative effects. Other, less common skin type reactions include angioedema and diffuse erythema. Angioedema results in localized swelling and erythema of the face around the eyes and mouth. Patients with diffuse erythema often have orthostatic hypotension and a bright red appearance. These patients are treated with oxygen administered by mask, isotonic IV ﬂuids, and either 50 mg diphenhydramine or 0.1 mg epinephrine SQ (1:1000 dilution). If the patient is hypotensive or has a compromised airway, administering 0.1 mg epinephrine in the IVform (1:10,000 dilution) is recommended. Epinephrine acts on both the alpha and beta receptors of the sympathetic system and results in the relaxation of the smooth muscles of the bronchi and causes an increase in blood ﬂow and cardiac output. Intravenous administration of medications is necessary in the hypotensive patient because medications given subcutaneously will not be mobilized into the intravascular system in these patients. The most common reaction involving the airway is bronchospasm, during which patients often develop tachycardia and dypsnea. These patients often have a history of reactive airway disease. On auscultation, they usually have expiratory wheezing or both inspiratory and expiratory wheezing. Treatment that consists of 2 puffs from a beta-agonist inhaler, oxygen by mask, and isotonic IV ﬂuids is often effective. If a patient’s symptoms progress and he/she is hypotensive, 0.1 mg IV epinephrine (1:10,000) should be administered. Other airway-related reactions include laryngeal edema and pulmonary edema. Patients who develop laryngeal edema often have difficulty speaking and swallowing. They have inspiratory stridor due to their narrowed airways, and they require treatment with oxygen, isotonic IV ﬂuids, and 0.1 mg IV epinephrine (1:10,000). In contrast, patients with pulmonary edema are tachypneic, tachycardic, and diaphoretic. On auscultation, rales are present in the bases. Treatment of pulmonary edema involves the administration of oxygen by mask and isotonic IV ﬂuids, and furosemide 10 to 40 mg IV is recommended. Furosemide works as a potent diuretic. Reactions related to the vascular system predominantly include vasovagal reactions, cardiovascular shock, hypertensive crises, angina, and seizures. Vasovagal reactions and cardiovascular shock reactions both present with hypotension. These events are distinguished from each another in that vasovagal patients will be bradycardic and patients in shock will be tachycardic. Vasovagal reactions are often related to the needle puncture for IV placement or occur in the percutaneous biopsy procedures. As previously stated, these patients are hypotensive and bradycardic. They are usually pale and have a decreased level of consciousness. Treatment often requires only the elevation of the patient’s feet and/or the administration of IV ﬂuids. Occasionally, 0.5 mg atropine will be needed. Atropine has anticholinergic effects, and tachycardia occurs because of the paralysis of vagal control. Cardiovascular shock patients, on the other hand, are hypotensive and tachycardic. These patients require oxygen, isotonic IV ﬂuids, and 0.1 mg IV epinephrine (1:10,000). Hypertensive crisis is an extremely rare reaction in which the patient’s diastolic blood pressure is >120 mm Hg. Patients have throbbing headaches and may be confused or nauseated. Treatment with nitroglycerin, either in the sublingual tablet form (0.4 mg) or topical 2% form (1/2 inch strip applied to a 1 × 3 inch area), is often effective. Furosemide may also be used in these patients. Nitroglycerin acts by relaxing vascular smooth muscle to decrease the blood pressure. Nitroglycerin can also be used in patients who develop angina related to contrast administration. These patients are treated with oxygen, IV ﬂuids, and nitroglycerin. Finally, occasionally seizures can occur. These are typically due to hypotension and are often self-limited. In most cases, patients require observation and supportive therapy only. Maintaining the patient’s airway, and administering oxygen and IV ﬂuids will often sufﬁce. If seizures persist, it can be helpful to administer a benzodiazepine such as 2 to 4 mg IV lorazepam, 5 mg IV diazepam, or 2.5 mg IV midazolam. These drugs work to depress the central nervous system. A few additional situations may be encountered with the administration of contrast. Patients will occasionally develop uncontrolled shaking known as rigors. These are often self-limiting. If they persist, 25 to 50 mg meperidine has been found to be effective. The mechanism in the development of rigors as well as the reason for the effectiveness of meperidine is uncertain. As patients often have multiple tests scheduled for the same day and have been without food for many hours, patients may experience a hypoglycemic episode during which they feel weak, dizzy, or faint. Patients usually require only a glass of juice to relieve their symptoms. On occasion, a 15-g glucose tablet or the administration of a 50% dextrose solution will be needed. When giving IV ﬂuids to these patients, a 5% dextrose in water solution is recommended. It is important to remember that pediatric patients may also have contrast reactions but may be unable to communicate their symptoms. It is a good idea to undress the infant to fully determine the extent of a skin reaction. Having a treatment card with the proper dosages listed for each of the common drugs used in cases of reaction and knowing the patient’s weight are helpful to quickly treat these uncommon reactions. Extravasation of contrast into the soft tissues has been reported to occur in 0.3% to 0.6% of contrast administrations.8-11 Most extravasations in our practice involve small volumes (<50 mL). Extravasations are treated with the use of elevation of the extremity above the level of the heart and the addition of either cold or warm packs over the site every 2 hours for up to 12 hours if needed. The site must be monitored for the development of altered sensation or perfusion, ulceration, or blistering as well as for increasing redness, swelling, or pain. For large-volume extravasations (>100 mL), consultation with a plastic surgeon is usually requested. All instances of contrast reactions or extravasations and the subsequent treatment administered must be documented. It is helpful to record the information in patients’ medical records and alert their physicians to any contrast reaction. With this information, the physicians can plan for premedication prior to future contrast examinations or can consider the use of a different type of imaging procedure. It is helpful to provide patients with both verbal and written instructions on the signs and symptoms of possible delayed reactions as well as contact phone numbers in case problems or questions arise once the patient leaves the radiology department. While nonionic contrast agents and gadolinium agents result in few reactions, most of which are mild reactions, the importance of proper screening of patients prior to the administration of contrast and being prepared with the proper medications and equipment in the event of a reaction cannot be underestimated. Establishing a screening process for patients undergoing contrast-enhanced examinations can increase efficiency and patient safety in a busy practice setting. Since reactions are uncommon, it is important to hold periodic reviews of this information and to have printed materials available for reference when these events occur. Lasser EC, Berry CC. Nonionic vs ionic contrast media: What do the data tell us? AJR Am J Roentgenol. 1989;152:945-946. Nelson KL, Gifford LM, Lauber-Huber C, et al. Clinical safety of gadopentetate dimeglumine. Radiology. 1995;196:439-443. Lasser EC, Berry CC, Talner LB, et al. Pretreatment with corticosteroids to alleviate reactions to intravenous contrast material. N Engl J Med. 1987; 317:845-849. Lasser EC. Pretreatment with corticosteroids to prevent reactions to IV contrast material: Overview and implications. AJR Am J Roentgenol. 1988; 150:257-259. Lasser EC, Berry CC, Mishkin MM, et al. Pretreatment with corticosteroids to prevent adverse reactions to nonionic contrast media. AJR Am J Roentgenol. 1994;162:523-526. Comments in: AJR Am JRoentgenol. 1994;162:527-529 and in AJR Am JRoentgenol. 1995;164:508-509. Greenberger PA, Patterson R. The prevention of immediate generalized reactions to radiocontrast media in high-risk patients. J Allergy Clin Immunol. 1991;87:867-872. Greenberger PA, Patterson R, Radin RC. Two pretreatment regimens for high-risk patients receiving radiographic contrast media. J Allergy Clin Immunol. 1984;74(4 Pt1):540-543. Cochran ST, Bomyea K. Trends in adverse events from iodinated contrast media. Acad Radiol. 2002;9(suppl 1):S65-S68. Jacobs JE, Birnbaum BA, Langlotz CP. Contrast media reactions and extravasation: Relationship to intravenous injection rates. Radiology. 1998; 209:411-416. Grant KL, Carmamo JM. Adverse events and cost savings three years after implementation of guidelines for outpatient contrast-agent use. Am J Health Syst Pharm. 1997;54:1395-1401. Cohan RH, Bullard MA, Ellis JH, et al. Local reactions after injection of iodinated contrast material: Detection, management, and outcome. Acad Radiol. 1997;4:711-718.
Review of common and uncommon contrast media reactions. Appl Radiol.